Though drinking alcohol is forbidden in Islam, in classical Persian literature wine was a common subject for most authors and poets. The debate as a popular genre was often used to let forbidden objects or ideas, in this case the wine, present the pro’s and con’s and argue about their position in an Islamic society. A very popular theme was the debate between wine and a rose. In this highly interesting article, the author discusses a treatise by the thirteenth century author Muhammad Zangī Bukhārī Gul u mul (“The Rose and the Wine”). The form of the debate offers the poet an opportunity to list both the positive and the negative qualities of each of the objects, using citations from even the Qur’an and prophetic traditions. He also must exploit all possible traits so that the speaking object can defend itself and prove its superiority to its adversary. Len Green recently published Rose Bay Rubaiyat, in which he highlights the history and background of Khayyám’s poetry. He also published some paraphrases, written by himself. The book Rose Bay Rubaiyat has been published not for profit, and with appropriate authorization it is currently available for sale in support of Médecins Sans Frontières – Doctors Without Borders. (a) by cheque or money order payable to: L. Green, C/O Robert Green PO Box 1151 Darlinghurst NSW 1300 Australia. (b) or visit: www.paypal.com.au and select “pay money”. Enter Green’s email address: lbzgreen@iprimus.com.au then email him at this address to advise payment. Don’t forget to include a postal destination. 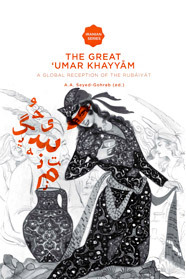 The book The Great ’Umar Khayyam, which consists of 18 essays about Khayyam’s influence, shows that traces of Khayyam can be found throughout Western literature and culture. Dutch poets such as Leopold and Boutens were inspired by him, for instance, but the quatrains also made their mark in 20th century painting and music. The volume is the result of a two days conference held in Leiden, July 2009, as part of a number of events that took place to celebrate the 150th anniversary of Edward FitzGerald’s first version of The Rubáiyát of Omar Khayyám and the transaltor’s 200th birthday. Published in 2012, there is a digital edition available now. Click here. This title from Anthem Press, edited by Adrian Poole, Christine van Ruymbeke, William H. Martin and Sandra Mason, was initially published in 2011, but is now available as Ebook. The volume of essays is based on a conference held in July 2009 at Trinity College, Cambridge to celebrate the bicentenary of the birth of Edward FitzGerald (1809) and the 150th anniversary of the first publication of his ‘Rubáiyát of Omar Khayyám’ (1859). The ‘Rubáiyát’, loosely based on the verses attributed to the eleventh-century Persian writer, Omar Khayyám, has become one of the most widely known poems in the world, republished virtually every year from 1879 (the year of FitzGerald’s fourth edition) to the present day, and translated into over eighty different languages. And yet, with a few exceptions, it has been systematically ignored or at best patronized by the academic establishment. This volume sets out to explore the reasons for both the popularity and the neglect. Broadly speaking, the essays are divided into two main blocks. 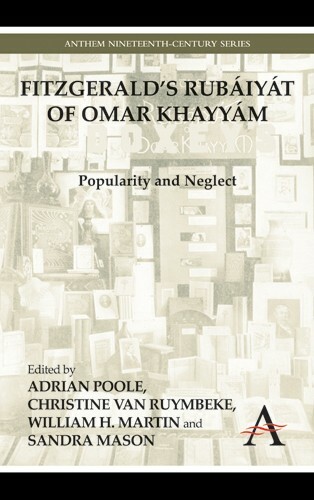 The first six chapters focus primarily on the poem’s literary qualities (including consideration of its place in the tradition of verse translation into English, the idea of ‘nothingness’, and ‘syntax and sexuality’), the last five on aspects of its reception (including essays on the late-Victorian Omar Khayyám Club, on American parodies, and on the many illustrated editions). They are linked by three essays that address key ‘facilitators’ in the poem’s transmission (including the significant but neglected issue of cheap reprints). Click here for more information, and to order the book.